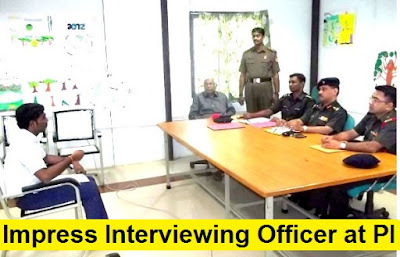 How to Impress Interviewing Officer at Personal Interview for SSB-Interview is an interaction with the interviewing Officer through which he checks the same qualities which are being checked by the Psychologist and the GTO respectively. He asks general questions related to individual’s service, family, schooling, friends, hobbies, interests, sports etc and information furnished by the individual in his PIQ form. The interview process followed at the SSB is based on Behavioral Interview Technique. Here, the interviewer establishes a friendly association with the candidate through his informality and then probes your past behaviors to extrapolate your likely behavior in the future. How to Impress Interviewing Officer at Personal Interview for SSB ?
. Wear neat and clean light color shirt and dark color trousers duly ironed.
. Leather shoes duly polished with dark color socks. What is seen in a candidate at the SSB ? Wearing of Tie is optional. As soon as the Interviewing Officer calls the candidate for interview, seek his permission very humbly e.g. “May I come in, please sir” and wish him according to time in very respectful manners. Look very cheerful and walk confidently towards the chair provided for the candidate. When the IO asks to sit down, sit upright on the chair and be comfortable. Be original, honest and attentive. Listen the questions very attentively and answer accordingly.
. Maintain eye to eye contact while answering. Don’t look upward-downward or sideways. Give correct and factual information/answer. DO not bluff. If you do not know the answer of any question, simply say “Sorry Sir I don’t have knowledge of this” instead of giving wrong answer. While answering, speak confidently and loudly with smiling face. No complaints, comments, suggestions on testing, food, accommodation rather express thanks and gratitude. If they invite action, say “No thank you very much, sir”.